A mental health epidemic among young people and "toxic" sectarianism at a Belfast hospital are among the headlines on Monday. The Irish News reports that, in 2012, Belfast City Hospital staged a covert investigation after allegations of "nasty and vindictive" incidents involving security staff. The newspaper says that it has obtained leaked documents which reveal the level of sectarianism at the hospital. The confidential report, which was given to the Belfast Trust in January this year, said that it was "clear that the atmosphere was toxic". A Catholic employee allegedly received death threats and bullets to their home while the report also contained claims of "offensive material" being posted on lockers, defaced notice boards, the racial abuse of Filipino staff and some staff members wearing Rangers football tops to work. The newspaper also quotes poet William Butler Yeats' line 'peace comes dropping slow' for an interview with two teenagers involved in organised fights at the Waterworks Park in north Belfast. Dylan Mooney and Gerard Wylie, from the Shankill and Ardoyne areas respectively, recall how Catholic and Protestant children, who had made friends through cross-community projects, talk frankly about their experiences. 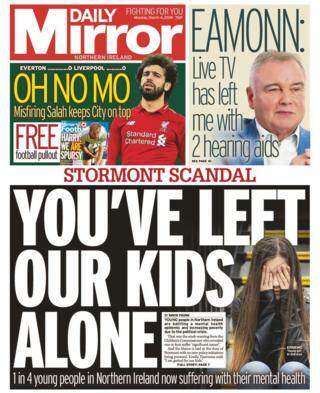 The Daily Mirror leads with a story on young people in Northern Ireland "battling a mental health epidemic and increasing poverty due to political crisis". The newspaper reports that the Children's Commissioner for Northern Ireland Koulla Yiasouma has warned that one in four children suffer "significant issues". In the absence of a functioning Stormont, Ms Yiasouma said she is "gutted for our kids". Eamonn Holmes has also opened up about his hearing loss in the newspaper. The broadcaster from Belfast said he was shy about wearing hearing aids at first, but says no one even noticed them. "We have to wear earpieces [at work] and I have been in live television for nearly 40 years," he said. "There's been a constant array of frequencies and voices pounding in my ear, so it didn't really come as a surprise to me when I heard there was some hearing deterioration." The Belfast Telegraph's front page carries the stark headline 'Soldier who killed our father will answer to God'. In the newspaper, the children of a man shot dead on Bloody Sunday have said the soldier who pulled the trigger will have to "answer to God" and should not be prosecuted. Gerard McKinney's son and daughter spoke out after claims that four veterans are expected to be charged with murder. In the News Letter, unionists back plans to curb soldier court cases. Senior members of the DUP and UUP voiced their support for a 10-year limit on legacy prosecutions, a proposal from the defence secretary reported in The Sunday Times. Sinn Féin said any such plan would put British soldiers "above the law". MLA Linda Dillon added, "There can be no immunity or impunity for British forces." The newspapers also all cover another arrest in relation to the murder of Ian Ogle. Mr Ogle, 45, died after he was stabbed and beaten in the street near his home in Cluan Place, off the Albertbridge Road, in east Belfast on 27 January. A 32-year-old man was arrested by detectives and detained at Manchester Airport on Sunday evening on suspicion of murder.